Information access is a concern for both employers and employees. Employers need their workforces to have the necessary information to perform efficiently and effectively. Likewise, employees are motivated to avoid the missteps and frustrations of working with incorrect, outdated, or insufficient information. A recent APQC survey revealed just how important consistent, robust access to trustworthy information is to employees. People want to work in organizations where they can easily identify the most relevant, valuable information. By understanding how employees locate and interact with work-related information, organizations can improve findability and increase confidence in enterprise resources. 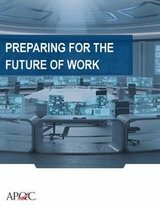 Note: This article is adapted from APQC’s report, Preparing for the Future of Work: The Latest Trends in Office Design, HR Policy, Collaboration, and Search and Information Delivery.